How will shellfish fare as ocean conditions shift? Months of experiments gave Meredith White ample time to observe her laboratory subjects: scallops. And perhaps for them to observe her, too. Resting in their trays, drawing water across their gills for food and oxygen, the scallops reveal rows of shiny eyes ringing the edge of their shells. “You just feel like they’re watching you,” White said. “And they do react to shadows and movement.” Pass a hand over their trays, and they instantly close up. Take them out, and they just might squirt seawater in your face. “Sometimes I’d wear the same old clothes in the lab day after day, because I didn’t want all my clothes to get salty,” White said. In her research as a graduate student in the MIT-WHOI Joint Program in Oceanography, she got well acquainted with scallops’ idiosyncrasies. “Scallops have the most personality of any bivalve,” she said. Clams and cockles bury themselves in the sand, oysters cement themselves to a rock or reef, and mussels use their “beards” of strong byssal threads to anchor themselves on rocks or pilings. 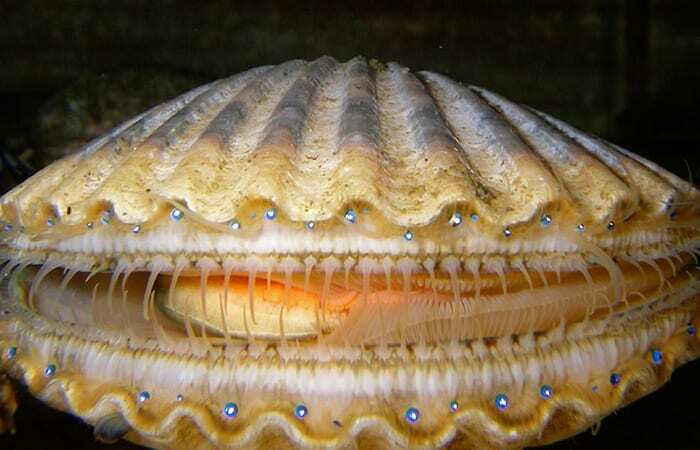 But scallops rest on the seafloor and use their formidable (and delicious) adductor muscle to clap themselves through the water by opening and closing their shells. This mobility seemingly enables them to air their grievances in the laboratory. A scallop may become restless sitting in one spot and will swim around the tank to scout a new location. “Sometimes, a scallop will just clap itself around and settle back exactly where it was,” White said, and in the process rile up all its tankmates into a kerfuffle of clapping. But personality won’t carry the day as scallops confront a precarious future. The oceans are becoming more acidic, threatening shellfish’s ability to build shells. White took a close look at Argopecten irradians, the commercially valuable bay scallop. In particular, she focused on how changing ocean conditions might affect scallops during their sensitive, crucial larval stages. Carbon dioxide reacts with water to form carbonic acid and bicarbonate. That not only makes seawater more acidic, it makes carbonate less readily available for corals, shellfish, and some plankton to build their calcium-carbonate shells or skeletons. Plants and animals that have evolved in an ocean where the pH hadn’t changed for millennia may not readily adapt to rapid shifts. Average world ocean pH has dropped from 8.2 to 8.1 over recent decades and is expected to drop to 7.8 by the end of the century. Some coastal waters, however, already surpass the acidity prognosis for 2100 because of a double-whammy of human impacts: excessive atmospheric carbon dioxide and excessive nutrients entering the ocean from fertilizer, sewage, and septic tank runoff. The nutrients fertilize blooms of algae, which die and provide a banquet for bacteria. These decomposing organisms crank up their metabolism the same way we do, gobbling up oxygen and releasing carbon dioxide, which acidifies waters to a pH as low as 7.4 in summer months. These summer pH dips coincide with scallop spawning season. Twelve to 24 hours after fertilization, the larvae begin the critical task of using calcium and carbonate to calcify a shell. Importantly, this task is fueled by the energy reserves put into the egg by the parent scallop; the larvae can’t eat, because they have yet to develop mouths! As the larvae float in the ocean, growing and transforming their minuscule bodies, they simultaneously face a gantlet of predators, limited food reserves, and dwindling time to find a place to settle down and grow. “Really big changes happen early in life as they go through stages of development on time scales of hours,” said WHOI biologist Lauren Mullineaux, White’s Ph.D. co-advisor. White grew up spending summers exploring the shores around her family’s rustic cottage in Harpswell, Maine, with a keen eye to the tides to maximize time scooping up sea urchins and other animals in shallow waters. As an undergraduate, she majored in chemistry. So she was well-suited for graduate school fieldwork. White bundled up in chest-high neoprene waders, layers of sweatshirts, and gloves for wintertime expeditions to collect scallops on Cape Cod shores. 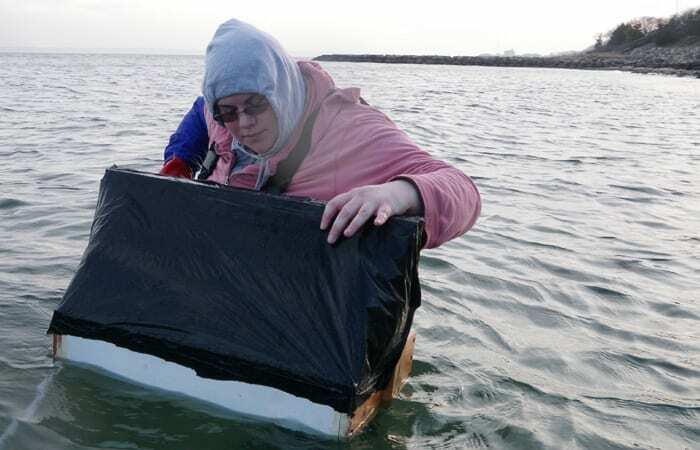 She used a plexiglass “look-box” to get a clear view down to the sandy bottom and towed a floating basket for her specimens. White isolated spawning scallops in deli-style plastic containers to capture the eggs and sperm and carefully raised water temperatures. She initiated their fertilization in an aquarium environment in which she could monitor and control carbon dioxide levels and acidity. For seven days, White grew a subset of larvae in only ambient seawater; a subset spent their first 12 hours in ambient seawater and then were subjected to more acidic seawater with a pH of 7.4; another subset of larvae grew only in acidified water; and a final subset spent their first 12 hours in acidified seawater and then were switched to ambient water. “These classic ‘switch experiments’ are often used by ecologists to test questions about a community,” Mullineaux said, but they hadn’t been applied to ocean acidification research. 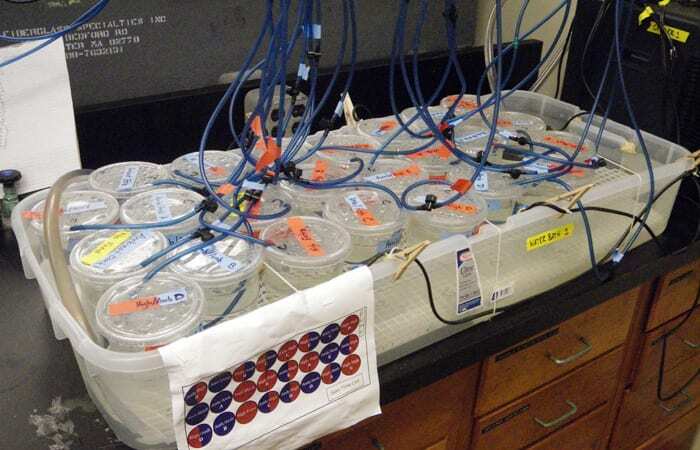 White measured the survival rate and shell size in larvae to test whether larvae spending their first days of life in normal seawater fared differently than larvae spending their first days in seawater acidified with high carbon dioxide. She also wanted to learn if any impacts are reversible, since larvae in coastal waters can be swept between polluted, acidic coastal areas and open ocean areas within spans of days or even hours. Across the board, “any exposure to the acidified seawater consistently decreased survival,” White said. Among the larvae that survived in all experiments, she found striking differences in their shells. She targeted her investigations on the critical 12-hour window in which the larvae initiate shell calcification. Larvae raised in ambient seawater, as well as larvae that had been switched from acidic to ambient seawater before calcification began, had bigger shells than larvae raised in the acidified seawater or switched into acidified water before calcification began. Even though all the larvae subsequently grew at similar rates, the ones with initially stunted shells never fully compensated for those undersized shells later on. “Small shell size usually means the larvae inside are small as well,” Mullineaux said, and that delays their metamorphosis into juveniles. This delicately orchestrated process relieves larval scallops from the threats they face as helpless plankton, so acidic waters that cause them to be smaller effectively extend their most vulnerable period. And even if they make it to the juvenile stage, they may still be at a disadvantage because of their relatively later start as juveniles. “Even more surprising than the impact on shell size was the very different effect that ocean acidification has on the shell before it’s even set down,” said Mullineaux. Measuring shells so small that it took a scanning electron microscope, White noticed that some shells had an unusual dark spot. These were strange indentations at the shell’s hinge, and this hinge deformity was always more frequent among scallops that had been in acidified water during their first 12 hours of life, before calcification even begins. “Typically, larvae that have any kind of deformity are toast,” Mullineaux said, “so I suspect that kind of deformity could have a big influence on long-term survival.” The fact that this happens even before the critical exposure period for shell size shows the complexity of predicting how animals will respond to a more acidic ocean. White published her study in April 2013 in the journal PLOS ONE. In June she earned her Ph.D. and headed back to her beloved Maine coast and the Bigelow Laboratory for Ocean Science, where she is studying the effects of ocean acidification on coccolithophores, a kind of phytoplankton. Like scallops, they have calcium carbonate shells. But, as far she knows, they don’t squirt or clap. White’s research was supported by a WHOI Interdisciplinary Award to Mullineaux and McCorkle and by the National Oceanic and Atmospheric Administration. White received a National Defense Science and Engineering Graduate Fellowship through the American Society for Engineering Education. Back in the lab, MIT/WHOI Joint Program graduate student Meredith White is smiling because for the first time, she successfully coaxed the scallops she collected to spawn in beakers. 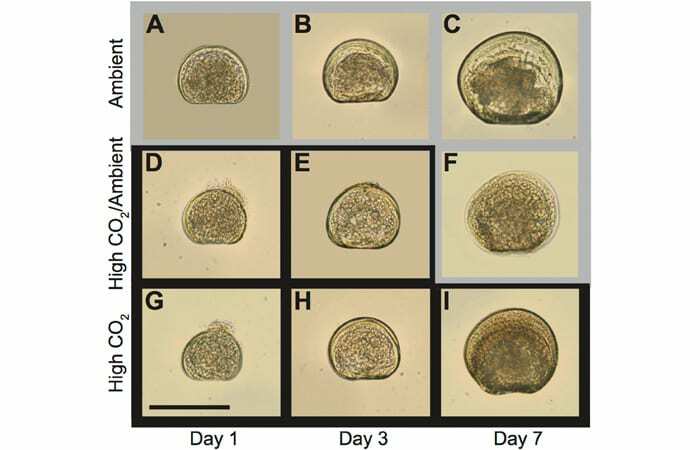 She isolated the scallop larvae to chronicle how they developed in their crucial first hours and days of life, under various conditions and scenarios. 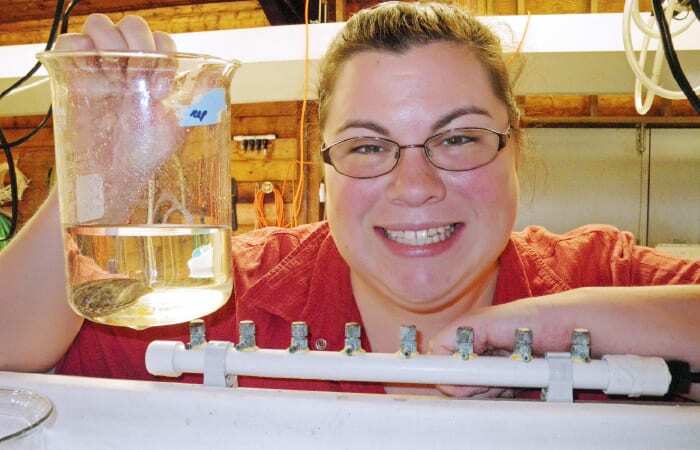 To investigate how more acidic seawater conditions affected the development of scallop shells, Meredith White conducted classic "switch experiments" on scallop larvae. She grew them under four different sets of conditions: a subset in only ambient seawater; a subset that spent their first 12 hours in ambient seawater and then were subjected to more acidic seawater with a pH of 7.4; another subset of larvae grew only in acidified water; and a final subset spent their first 12 hours in acidified seawater and then were switched to ambient water. Meredith White's results, published April 2013 in the journal PLOS ONE, showed scallop shell development for seven days, under three sets of conditions: ambient seawater (top); seawater with a high carbon dioxide level for three days, followed by ambient seawater for four days; and seawater with a high carbon dioxide level. Larvae shown represent the mean shell length for each treatment and age. The outline of each image corresponds to the CO2 treatment the larvae were experiencing at the time when the specimen was preserved in alcohol. 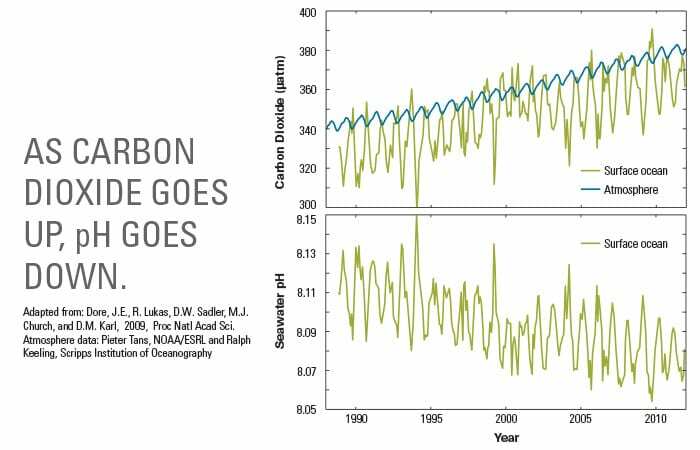 Gray = ambient CO2, black = high CO2. Images are all to the same scale; scale bar = 100 µm. Since the Industrial Revolution, increased burning of fossil fuels has sent more carbon dioxide into our atmosphere. Almost 30 percent of that carbon dioxide has been absorbed by the ocean, causing a fundamental change in the seawater chemistry. The carbon dioxide reacts with water molecules, creating more free hydrogen ions that drive down the pH of seawater and make it more acidic. Some of the hydrogen ions bind with existing carbonate ions in seawater to form bicarbonate. The net result is that the concentration of carbonate ions declines, so that corals have less of it to build their skeletons. Scientists predict that by the end of this century, the concentration of carbonate ions that corals need to grow will drop to less than half of preindustrial levels.